I am just as fascinated today by the humble string hopper press as I was when I was a kid. It was like a Play-Doh tool for the grown ups in my family–same idea except it squeezes out something edible (see this previous post for a picture and more about string hoppers.) Thin strings of rice flour dough dangle from a press, held high. The falling strands are swirled onto woven mats, then the mats are placed in a steamer to cook. Simple, but it intimidates me for some reason and I have yet to make them myself. 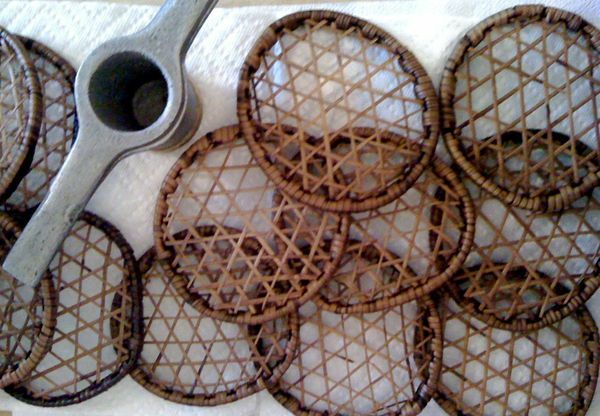 My aunt whips them up for me on a moment’s notice and I swear, the next time I’ll make them alongside her so that I can share a step-by-step tutorial with you, including any workarounds for the equipment she uses. Then we can all make them at home! But..I suspect there may be no easy workarounds for the equipment…in which case, we’ll all head to her place for some. She won’t mind. I was in Sri Lanka over Christmas holidays and love string hoppers- I’d love a tutorial! you were? im so jealous. i will try to get into my aunts kitchen some time before spring–stay tuned!